Kiku nodded solemnly. 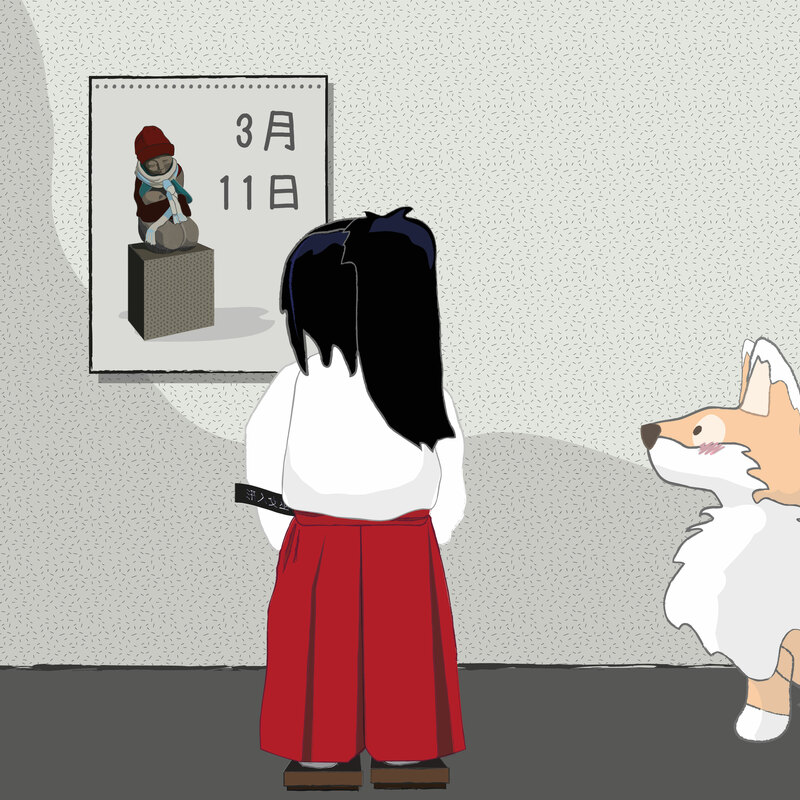 The friends had met first in 2014, shortly after Kiku’s arrival in Tokyo from England. 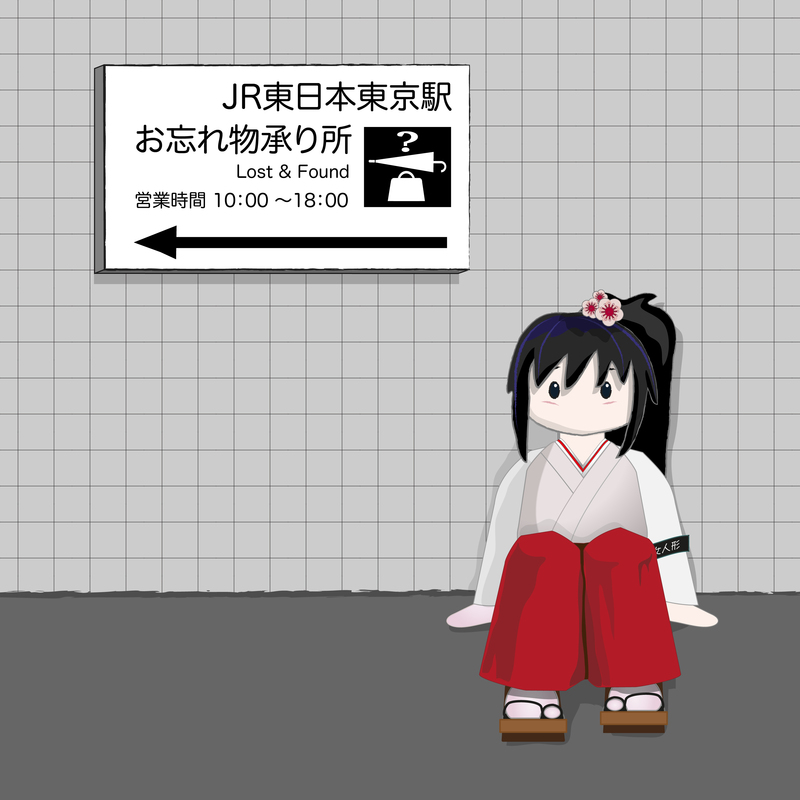 He had spent weeks travelling on trains, exploring the city, when one day whilst wandering through a part of Tokyo station, he had noticed the little shrine maiden doll sitting under the sign to the Lost and Found office. 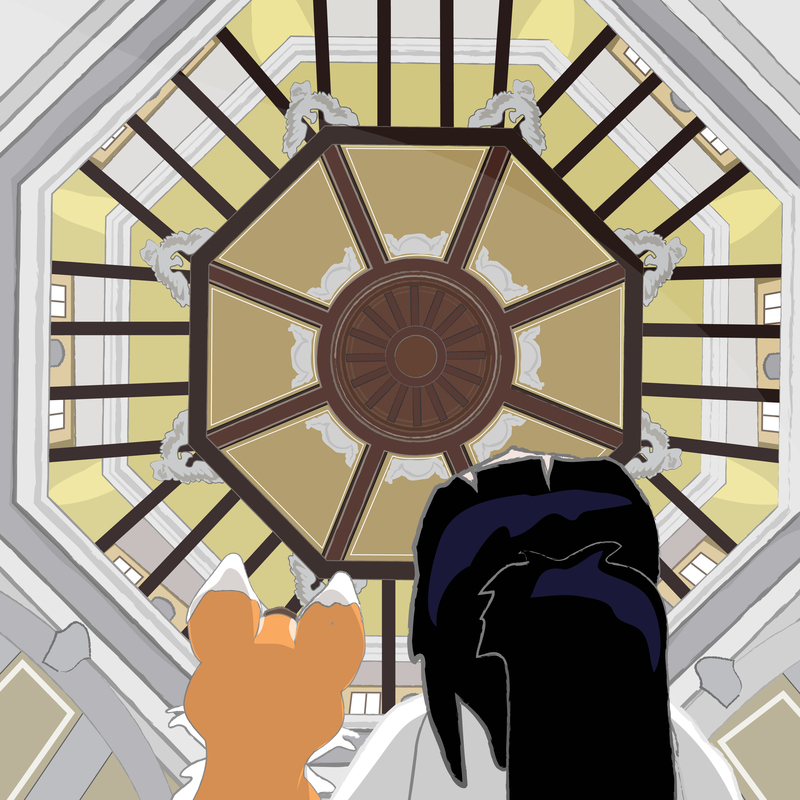 The area around the JR East Lost and Found office in Tokyo Station was where Miko-chan had been living for three years, after her owner had left her behind on a Tokyo train. Tokyo has one of the most efficient lost property systems, with station specific offices keeping items for a week before sending them on to the four-storey warehouse of the Tokyo Metropolitan Police Lost and Found Centre. 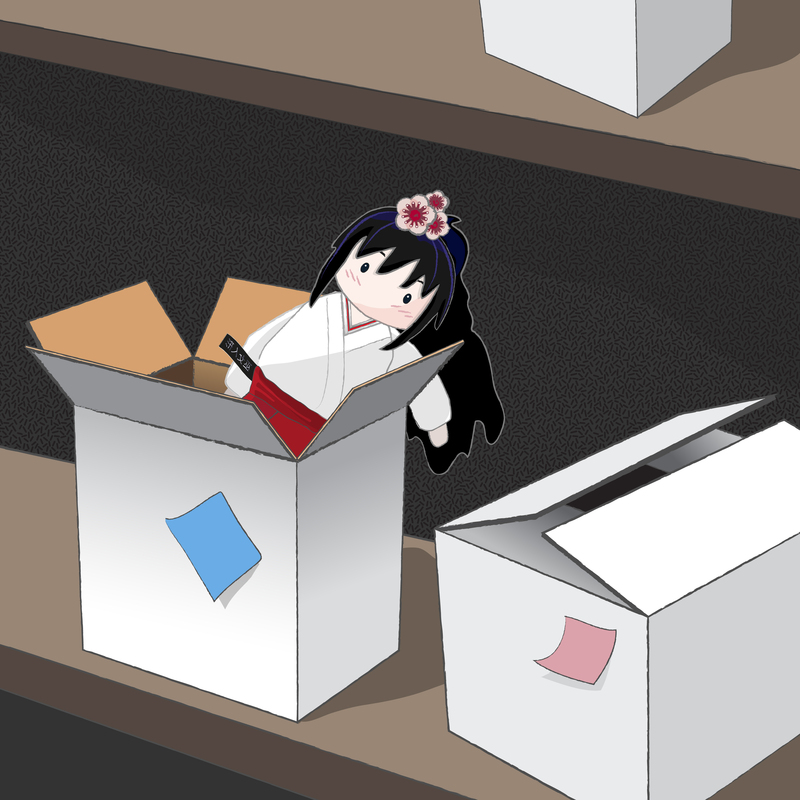 Miko-chan had run away whilst being transported to the warehouse and decided to stick around in Tokyo Station. 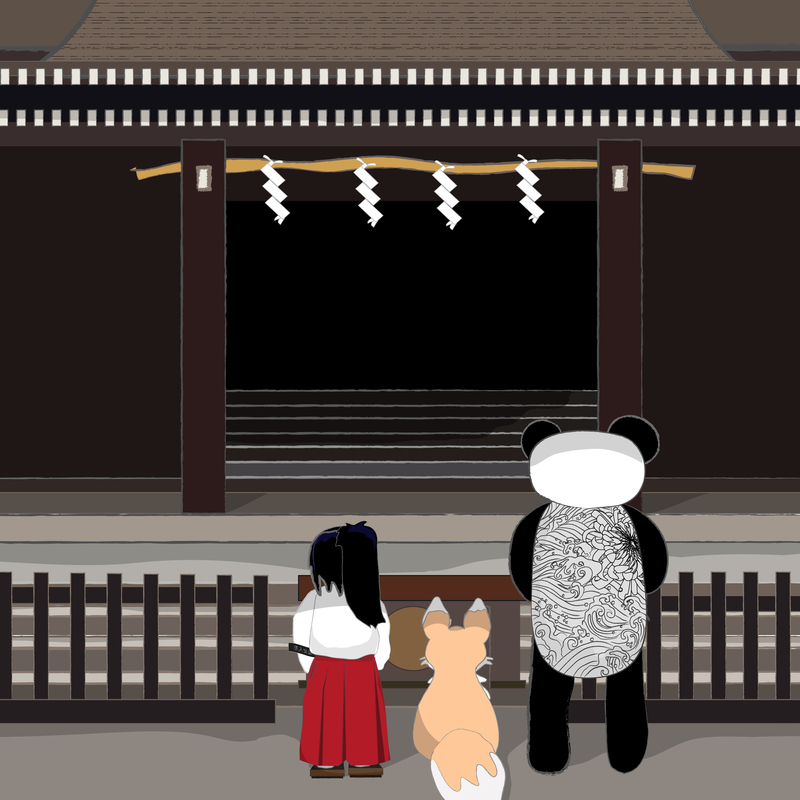 After visiting her regularly at the station for a few months, and sensing that she might be ready to move on, Kiku had asked if she would accompany him on his travels, and the pair had then explored the city together looking for a home, until they met Mama Kōjin at Oji Shrine on New Year’s eve 2014, and after this found a home at the Bamboo Bathhouse, where they had lived ever since. 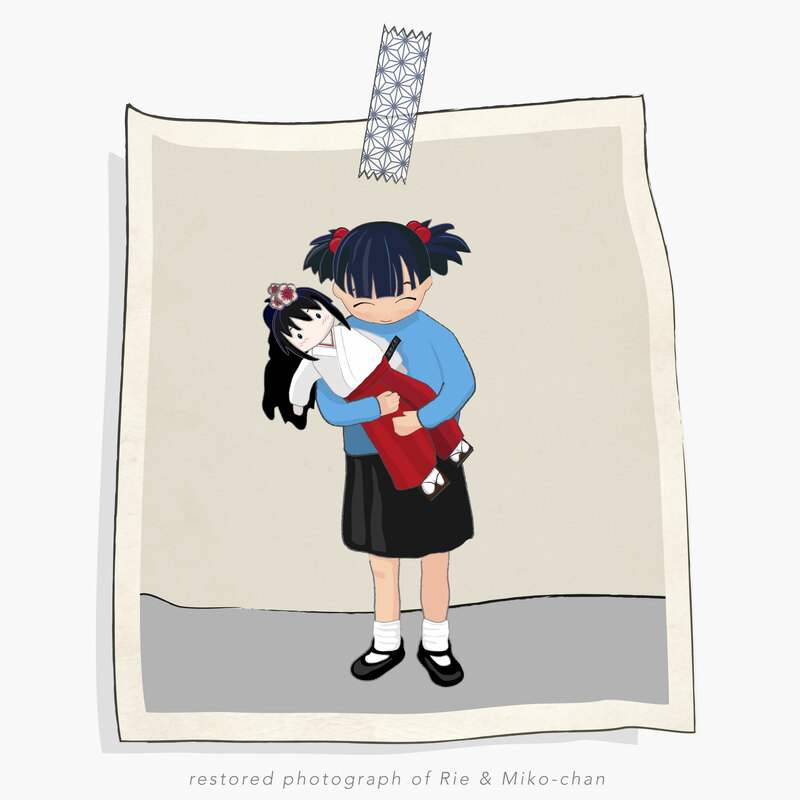 That evening, on the sixth anniversary of the disaster, the residents of the Bamboo Bathhouse said their prayers for Rie, the little girl who was lost, and her doll who was found. 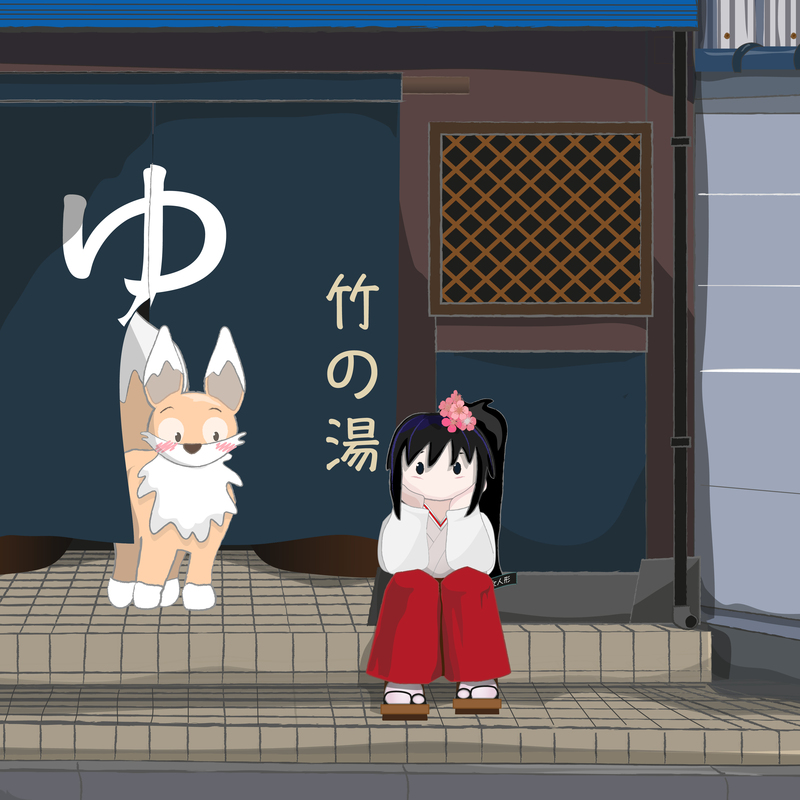 The story of what happened to Miko-chan’s owner is fictional, but inspired by real events. The Great East Japan earthquake struck on Friday March 11, 2011 at 2.46pm local time with a magnitude of 9.0. It was the most powerful earthquake to affect Japan and the fourth largest since modern record keeping began. The epicentre was on the seabed approximately 70km off the eastern coast of the main island of Japan and caused tsunami waves reaching heights of 40.5 metres (133ft), some of which reached as far as 10km inland. The tsunami caused the meltdown of three nuclear reactors at the Fukushima Daichi Nuclear Power Plant and the nuclear complex remains an issue to this day. As of 2015, 15,984 deaths were confirmed, with around 2500 still missing and over 200,000 people relocated. Many schools in the town of Ishinomaki, Miyagi prefecture were completely destroyed, with tsunamis reaching 10 metres in height sweeping almost 5km (3 miles) inland from the coast. The Okawa Elementary School in Ishinomaki, which is 4km inland lost 74 of 108 students and 10 of 13 staff, as they evacuated too late and were crossing a bridge over a river near the school when the tsunami reached them at 3.36pm. 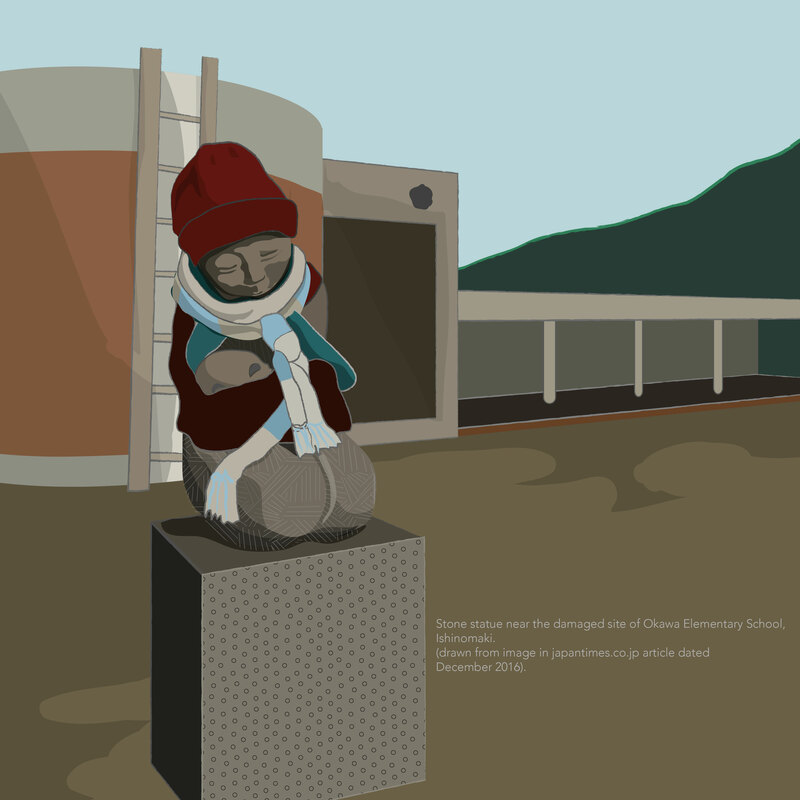 The tragedy has been the subject of court proceedings by families who blame the school for not evacuating when the earthquake information was received – other towns similarly affected lost no students because they had emergency procedures in place. The school has been preserved by the city as a memorial, and as a site for disaster education. 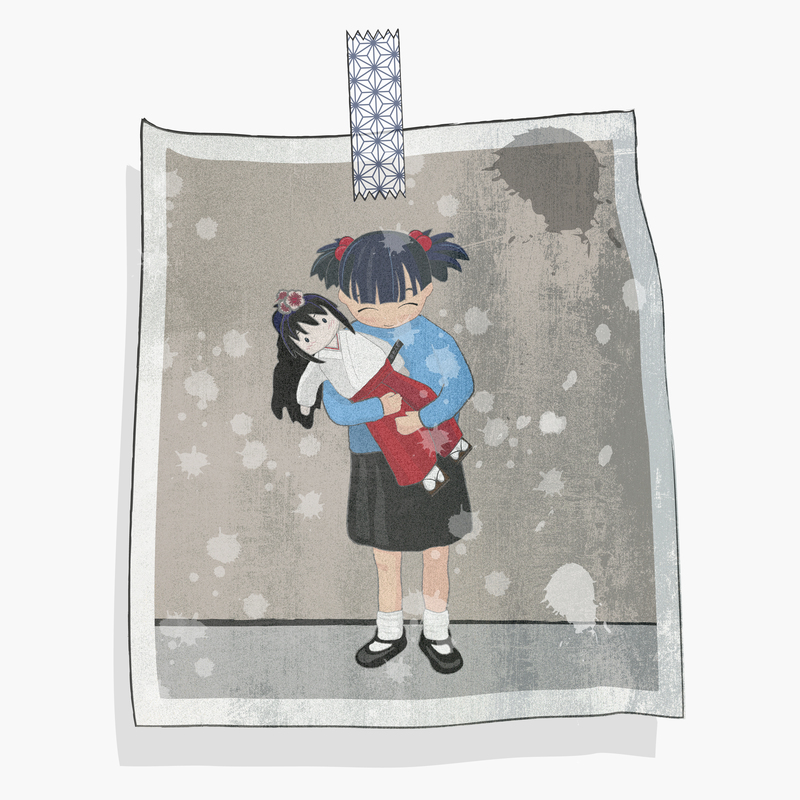 Japan’s lost and found culture has led to projects reuniting people with the objects they lost during the 2011 tsunami. One initiative called ‘Memory Salvage’ recovered photographs swept away by the water, restored and returned them to their owners. This led to ‘The Lost and Found Project” (http://lostandfound311.jp/en/), where badly damaged photos are used to tell the story of what happened around the world.